Home to 716 first year students, Boland Hall is the largest residence hall on campus. Boland Hall is divided into two halves: North Boland and South Boland. North Boland rooms are suite style rooms, where four people share a bathroom. North Boland also houses the “Bridge Triples”. These rooms are in the bridge of the building and suites consist of 2 rooms of three students. Every floor in Boland North has a lounge. South Boland is corridor style rooms, where the entire floor shares a very large bathroom. Roughly 30% of the rooms in Boland Hall are triples or quads. Boland Hall is also the home of the beach-style volleyball court and the Pirate Cellar, two of the most popular programming spaces on campus. 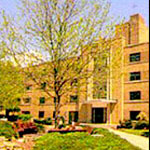 Boland Hall has 19 resident assistants, 2 Priests In Residence, 2 professional staff members, as well. Is there a curfew for students?